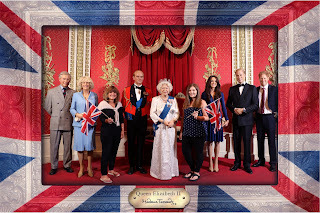 Recently, I headed to Madame Tussaud's with my mother. I thought I would put together a quick review for anyone thinking of going themselves. Please note, this is for the London location. 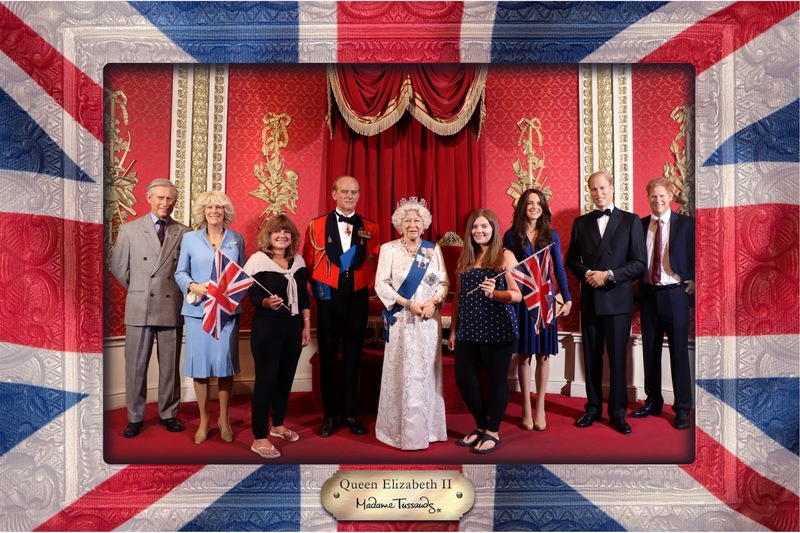 Interestingly, the most popular wax figures were the royal family and it's actually the only one who you can't take your own pictures with. Mum happened to like the photograph so much that she wanted to buy it. Admittedly, I also loved the picture and it looks totally real to me! Everything was very elegantly dealt with and the background was stunning! I think the flags only added to the patriotism. I knew going into it that I would be disappointed that I couldn't have pictures with people. My mum is a terrible photographer and usually they're either blurry, a finger is over the lens or the photo is completely off centred with no one actually in it. Anyway, as expected, there were only 2 she even remotely took decent pictures of me, despite me giving her repeated 'lessons'. In the end, I got quite angry at her and we took our separate paths around the tour. I really liked how the rooms were split up and thought it flowed quite nicely together although it's nothing like I imagined. The venue is actually quite small and compact so there aren't actually that many wax figures there. The split the celebrities almost according to their reason for fame with the first room being A-Listers along with some of the mega popstars. Without a doubt the most popular figure was Kim followed by George Clooney, my mother's personal favourite celebrity, but I think the later was probably because it was an easy photo opportunity and the likelihood of being inadvertently photobombed was dramatically reduced. Kim had her own separate area with a waiting line and a bollard to stop people getting in the way. Next up was the more magical elements. There was a big set from King Kong which presumably they interchain depending on the current big film, although that must be extremely expensive. Personally, I was shocked at how quiet the area around Katniss Everdeen was. I know the end of The Hunger Games meant the end of an era but still, it's not been that long. This linked to all the action movie figures. My personal favourite and the one I was looking forward to the most was the YouTube space with Zoe Sugg and Alfie Deyes. The only real information I had into coming into Madame Tussauds was really through their vlogs on their experience but I was really disappointed with them. They were truly the worst models in the location. Even looking at them in picture form you can see they're pretty terrible which makes me think that they were perhaps rushed as it was such a big event when they were first released. The most surprising thing though, was how BIG their set was. Unlike EVERYONE else who had to share their space and were surrounded, these two had their own sets and it was huge! After them, came all the Olympics stars and other professional sport athletes, which I actually loved. I thought they really captured the essence of some of them especially Jessica Ennis, Mo Farrah ect. Interestingly, they put Tom Daley and a gymnast far higher up and most people walked past them not realising. It defintely wasn't clearly apparent. Onto a bit of a mixed bag with scientists, land mark people and a little history lesson of the royal family. With the current ones mentioned previously. This was quickly followed by singers and bands before getting onto the political members of the population. Unusually, the UK Prime Minister wasn't there...perhaps waiting for the news from the 2017 General Election. Donald Trump was without a doubt the biggest set but uncomfortably, very few took photographs with him. I really liked that they had a more of an interactive element half way through where they explained where the idea of Madame Tussauds came from and then explained the process of how the models come to be. I personally found the speed quite slow and information quite dry but my mum soaked it all up. I thought it was interesting that they chose to use Beyonce as the case study but I did like that she went out of her way to put together a video as well. I think that would really appeal to the younger audience, or those like me who couldn't be bothered to read 20+ mini signs. The next set was completely unexpected but totally worth it. Instead of just having the Marvel and Superheroes as lone figures they crowded us into a room, almost spaceship like. After about 10 minutes, we headed into a theatre and I thought a 4 movie with the heroes in added a lot to the experience. In all honesty, I was quite bored seeing figure after figure but this broke it up and was a perfect add on. The seats moved, they kicked you in the pack, wind blew on you, water spurted...it was a remarkably action packed viewing experience. I loved the huge Star Wars collection. I don't actually know any of the old films but I have watched the two latest releases and I still felt very connected to the sets. I was pleasantly surprised that you could actually take pictures of the models without people getting in the way. Despite it being quite crowded, people were particularly pleasant and understanding. You can take the whole tour at your own pace which was lovely considering a start time was given. Overall, I think you have to be a specific type of person to want to go to something like this multiple times, but for a once in a lifetime experience, it was worth it. Especially as we got Buy 1, Get 1 free on tickets!